Lately on Instagram and Facebook, we’ve explored ways to refresh your space. It’s been a lot of fun taking suggestions and ideas from our followers and vendors in the shop! You may be surprised there’s no need to completely refurbish your home or start all over; adding a single new element can easily transform the look. Below are several examples of how you can keep your home decor updated and fresh! Did you know 99% of people’s large pieces of furniture are neutral? We honestly don’t know the exact percentage, but many folks lean toward neutral sofas, occasional chairs, etc. so that you can easily swap out the accessories. The multi-colored pillow from Wheaton Whaley Designs adds a fun punch on this occasional chair from Eileen and Co.
Slipcovers and upholstered seats are another option to update chairs. 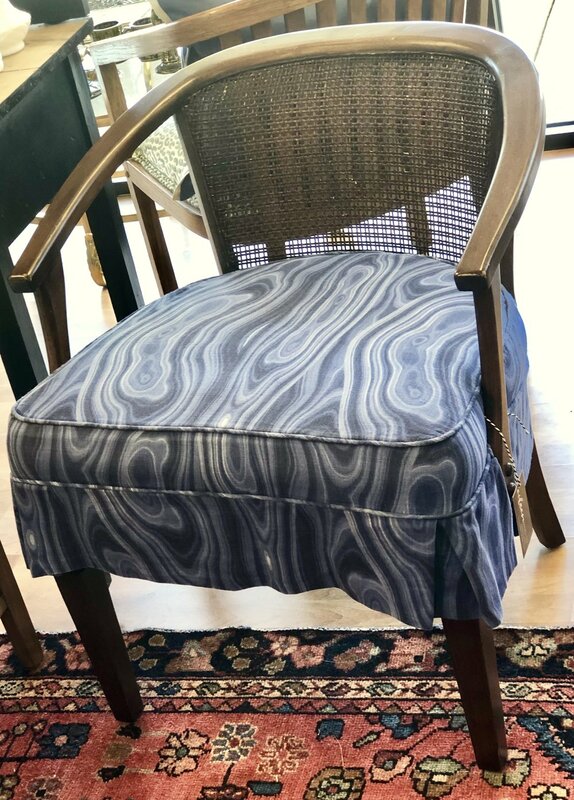 The modern blue malachite fabric slipcovered over the occasional chair from Eileen and Co. instantly renews it. Speaking of occasional chairs, check out the fresh white coat on this cane back chair from Fox Hill Vintage. Paired with the bright new coral upholstery (the color of the year--might we add), this vintage piece is easily updated. And if you are part of the 99% of people who own neutral upholstered furniture, painting other pieces in the room are sure to add a pop to the overall scheme. Just imagine this bright coral buffet from The Dropped Leaf in your dining room. If painting the entire piece feels like too much, painting partial elements, like the frame or just the drawers, adds modern flair. We love how this antique dresser from The Dropped Leaf allows the beautiful wood drawers to shine against the grey painted frame. Similar to pillows, lamps offer the opportunity to completely change the look of room with just a quick switch. How fun is the orange lamp from Upstated Vintage?! Jaws will drop when they enter the room and see this fun, unexpected pop. Did you know 99% of people also own white or ivory lamp shades? Again, we have no idea if this statistic is true, but if you’re not ready to completely replace a lamp, adding a colored shade can finish the overall look. This coral-y orange shade from King’s Classics brings out the colors in the vintage lamp base. Might we also suggest updating your finials to complete the ensemble. We’ve already mentioned how paint can transform furniture and it can certainly do that for your walls as well. If you’re not ready to undertake such a project, consider updating your walls in other ways. Recently, we discussed how wallpaper can update your home. Check out the blog post here and consider our selection of Tempaper to update a wall, staircase, furniture, small room, and more. Another alternative is to create a focal point through art or displaying a collection. This abstract piece by Melissa Connor adds modern interest to home decor. If you own a collection of similar items (like china), create a wall display. This creates a focal point in the room and shows off your compilation of curated collectibles. Let’s keep this discussion going! We’d love to see you in store and hear how you’re updating your space and help you find the perfect piece to refresh the look.